The Vikings (1958. 1 hr, 56 min, 03 sec) is a historical drama directed by Richard Fleischer (20,000 Leagues Under the Sea (1954), Fantastic Voyage (1966), Soylent Green (1973), Conan the Destroyer (1984)) the film was produced and starred Kirk Douglas. Douglas was one of a handful of studio actors to figure out that the big money was not in acting but in producing films. The role of the producer has grown so much that today they are the arbiters of what gets made with the studios mainly interested in facilitating and distribution, which explains why Harvey Weinstein held such a powerful position in Hollywood. Douglas created Bryna Productions which, in collaboration with Stanley Kubrick released Paths of Glory (1957), Spartacus (1960) and The Vikings (1958) with Fleischer. 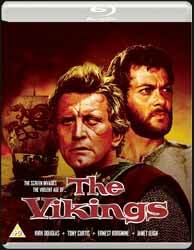 The Vikings is not overtly political like Paths of Glory, nor is it as spectacular as Spartacus, but it does hold its own as a solid swash buckler. The story goes that Tony Curtis only took the role of Eric on the understanding that he was the central character, however judicious editing leaves us under no misinterpretation that this is a Kirk Douglas film. Douglas (at the time of writing) is probably the last surviving actor from the ‘golden age’ of cinema, having been born in 1916 and since that time styles of acting have evolved and changed. In its time his acting would have been considered intense and strong, now it might be interpreted as a little too bombastic at times. The film shares a lot of DNA with the older Errol Flynn movies with lashings of fighting, a love interest, provided by Janet Leigh’s Morgana (another reason for the half-brothers to fight over after her ship is high jacked by the Vikings) as well as a final set piece attack on an English castle. Given that the film contains no CGI it produces some thrilling sequences, mostly by putting its star in harm’s way. There is the famous sequence when the ships are returning from a raid. The Vikings had a tradition that on their return all the men would run down the oars on the outside of the boat, something that Douglas does effortlessly while the stunt men fall into the water. There are some good extras on the disc. Interview with Sheldon Hall (32 min, 54 sec) talks about the film in general, but A Tale of Norway (28 min, 16 sec) is much better as it is an interview with the director who, along with the normal behind the scenes chat, talks about the lengths they went to make the film as authentic as possible. Lastly you have the Original Trailer. So, it not deep and meaningful but makes for great Saturday night family fare.